Hazelnuts are synonymous with Oregon. According to the Hazelnut Marketing Board, 98% of the hazelnuts produced in the United States come from Oregon. The Willamette Valley, with its mild weather, abundance of rain, and well-draining soils, has the perfect conditions for growing them. In 1989, the hazelnut was declared the state nut by the Oregon Legislature. Springfield has a special claim to fame when it comes to the delicious nut: it was home to the first commercial hazelnut orchard in the United States. In 1892 George and Lulu Dorris bought a farm in Springfield. They experimented with several different crops before settling on hazelnuts and creating Dorris Ranch. 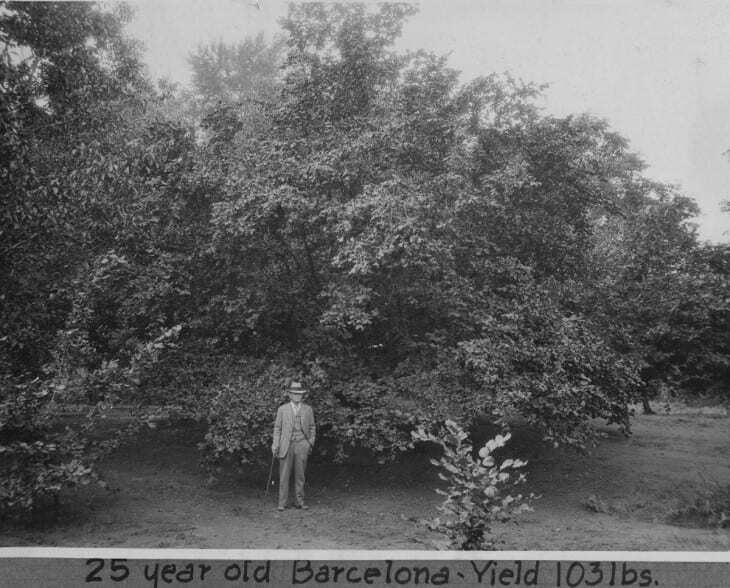 In 1905 Dorris planted five acres of hazelnut trees on his property. Over the next 50 years, the orchard grew to include over 9,000 trees on 75 acres. Dorris also propagated hazelnut trees, growing around 70,000 every year. He sold his feedstock throughout the country. 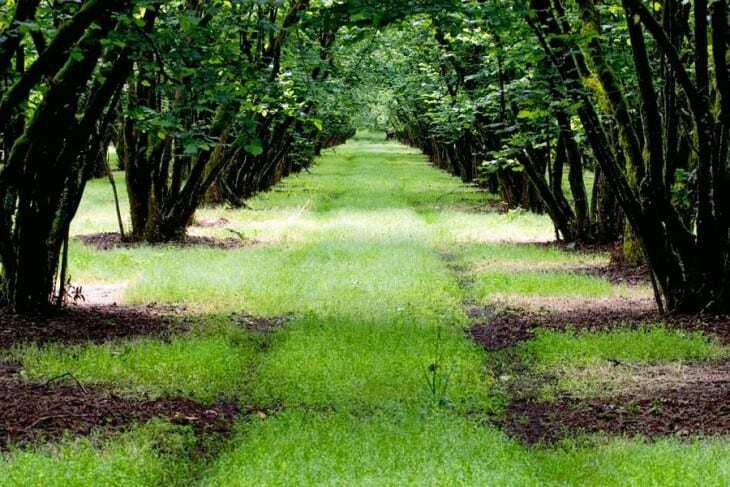 It’s estimated that more than half the trees in Oregon’s hazelnut industry came from Dorris’s nursery. In 1972 Willamalane Park and Recreation District bought the property. “We consider Dorris Ranch a living history site,” said Mike Moskovitz, Public Affairs Manager at Willamalane (now retired). That’s why they continue to run it as a working farm. 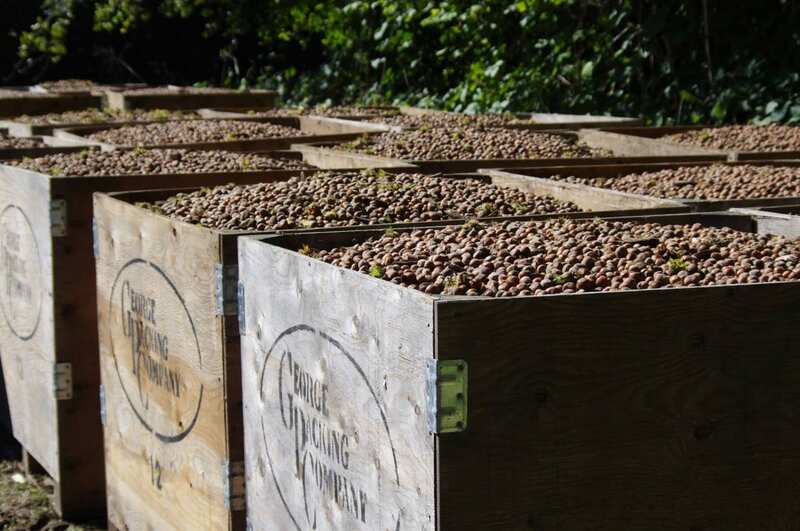 A local orchardist maintains the trees and harvests up to 50 tons of nuts every fall. Visitors can stroll along the walking trails, check out the trees, and stop at the Historic Village, which includes a replica of a pioneer homestead and a Northwest Coast Native American Plank House. The park is open from 6:00am to dusk every day. Plan your trip during hazelnut harvest months of September and October. Although filbert is a correct name for the nuts, the rest of the world uses “hazelnut,” Moskovitz explained. Since Oregon exports much of its crop overseas, the term hazelnut is more commonly used today. Moskovitz said his favorite way to eat them is raw and straight out of the shell. They’re also delicious in salads, breakfast cereal, candy, baked goods — and pretty much any other dish that calls for nuts. The Hazelnut Marketing Board has a long list of suggestions for how to cook with hazelnuts on their website. Try these stand-out sweets for Gluten Free Pear Chocolate Galette and Chocolate Caramel Hazelnut Shortbread with recipes on The Local Dish!